Fabricworm Weekly Giveaway! Jenean Morrison in Fat Quarters! This week we wanna hear which season inspires you most? Such lovely patterns in this line! I'm definitely a fall kind of girl- it's the most inspirational for me. Spring, summer and fall all inspire me a lot but they inspire me most of all DURING WINTER! Go figure! Love these fabrics. I have a hunch they would coordinate nicely with some Bryant Park fabrics I recently acquired. Jenean is amazing! Love this fabric! I love the fall colors! Thanks for the giveaway! I'm signed up for the newsletter. Thanks for the chance! Spring inspires me but I get a lot more done in winter. Love the fabrics. My fav season is fall, but I think spring is so inspiring after a dreary winter! I would say Winter inspires me the most. Maybe it's the Holiday season that I love. Summer inspires me the most. I love all the bright colors that time of year. Fall inspires me most because I know that is the time of the year when the weather turns and the quilts get the most use. I just tweeted about your giveaway. I forgot my Twitter ID its renegadequilter. I am already on your mailing list for your newsletter. Usually fall for me with all the holidays right there. Very cute collection, would love to win it! Great collection - right now I'm feeling pretty inspired by spring. 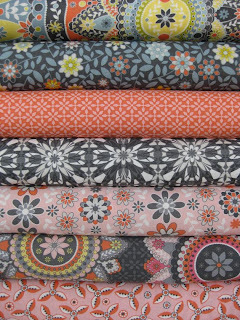 I receive your newsletter - thanks for a chance to win this yummy fabric. I put it out there on facebook! Spring definitely inspires me most - once it gets here!!! There are so many changes in color and texture in the spring landscape. Both Spring and Fall. I think it's the transitions that really make me want to start creating. I love summer-can't beat a cute little summer dress. Bright colors, pretty fabric with the sun shining! I am inspired by Spring the most. Winter is long and hard here in the Yukon (northern Canada), and when spring finally comes round (we still have tons of snow and it's the end of April!!!) we embrace it. Colours everywhere! Good afternoon, me again, just wanted to let you know that I did subscribe! Such a beautiful collection. Thanks for the opportunity to enter your giveaway. PS. How come you don't give a bonus entry for blogging about your giveaways? Spring! I love Spring colors, no matter what the season. I'm most inspired by spring--the arrival of sunshine and warm temperatures makes me want to be productive! such a gorgeous line, love the colour palette! thanks for the chance to win! i'm already signed up to receive the newsletter. Hmm. Depends how you mean. I like to use summer colors and fabrics. But I am inspired to create most in the holidays, when there are so many gifts to give. I am already subscribed to the mailing list. Not sure that counts? Love the collection. First time to the site. Winter inspires me to sew with bright colors to chase the gray away! I am most inspired by Fall because those are some of my favorite colors with summer being next. I am most inspired by summer. Here in Northern Wisconsin, we don't get much of a spring (it is snowing as I write this) and seem to just leap into summer which is when we can finally get outdoors without a million layers of clothing! Spring....I love all the new growth and blooms in my garden! Thanks for the super giveaway! I love fall - lovely inspirational season! Autumn inspires me most. I love the colors. I'm signed up for your newsletters. I am inspired by Spring (once it finally gets here!) - all the shades of green (my favorite color)that pop up in both plants & trees are so refeshing. Jenean Morrison's collection is cute! Thanks for the giveaway. Facebooked it! Facebook ID "Manda Colburn"
I am signed up for the newsletters! Spring is the season that inspires me with all of the new growth. Can't believe I wasn't signed up for the newsletter before- but I am now. stayathomelibrarian at gmail dot com. fall inspires me. I love the colors and the smell of crisp fresh air. But right now, living in WI, I'm ready to smell the spring flowers! I'm inspired most by fall. The colors are so deep and rich. Thanks for the chance. Hmmmm what inspires me? My children. I love spring with all the pretty flowers and can just see those colors in a bright new quilt. Love the orange tones in this collection! I put it out there on my facebook. I love this collection. I know what I would do with it. Ooh the patterns on these fabrics are sooo pretty! Had been subscribing to your newsletter. I am already an email subscriber to the mailing list. This is just beautiful fabric. I'm sure the winner of this will be thrilled. Thank you for the chance. I love these peachy corals paired with cool grays. Great giveaway - thanks! thanks for the chance to win this collection! i love it. and what season inspires me most? Definitely spring...it's like an opportunity for a fresh start. And everyone deserves one of those! Its a toss up between spring & fall. Spring definitely is inspirational as you are finally breaking thru cold, snow & hibernation. Usually I'd go with autumn, but this year it's summer because I'm pregnant and determined to remain not only cute, but comfortable. I'm sewing like crazy! gorgeous! I would love to either quilt or make little dresses for my girls with this! signed up for the newletter! And my favorite season is DEFINETLY summer. I love the heat! My most creative season is Spring! I'm a newsletter subscriber too! Here's my post for a chance to win. I'm already subscribed to the newsletter too. I'm a fall girl. definitely my favorite. love the fabric! Autumn is my most inspiring time to make quilts, but in spring I am inspired to make clothing and bags. I think it has to do with the temperature outside. Fall colors inspire me the most! Fall inspires me most. I love everything about it. Summer is the season that inspires me most because I love to play under the sun with sunblock on my skin. Favorite season: Autumn, of course. So much change and drama. Already signed up on newsletter. Spring/Summer inspire me the most. I have lots of energy for creating and the warm weather and days spent swimming at the lake or lounging around outside are perfect outlets to allow the creative juices to flow! LOVE the collection offered this week! Count me in! I would say winter because there's blue, white and Christmas. I'm already in your mailing list. Thanks! "Tweeted" as "Arimethia" on Twitter! Thanks again for offering up such a lovely giveaway! I find summer most inspiring! I love spring here the most. It feels like I survived winter and I am encouraged to begin new projects with bright fun colors. I receive the newsletter too. Hey! I joined the mailing list!!! each season inspires me... each one has its own sense of adventure and color!!!! Love the fabrics !! (not met a fabric i didn't love LOL). Autumn gives me the most ideas with the reds, golds and all the shades of browns. I think the colours and smells of Autumn (Fall) inspire me the most. Thanks for this gorgeous giveaway! My inspiration is spring! When all gets green again and starts to grow. I am most inspired by spring - everything is fresh and new and after winter I simply love all the colors! Thanks for the giveaway - love the fabric line! Ohh I love this collection! I'm on the mailing list too.. This looks like a great grouping! I would love to mix this with some solids! The fabric is so cute for gilrs! I'd have to say that fall is my most inspiring season, but spring isn't far behind. Oops, forgot to answer your question, so I deleted my first response. I love fall the colord of the leaves and folaige are just so warm and lovely. those fabrics are so lovely!